Courage is supported by courage with this adventurous couple. Freedom and initiative are the engines that will drive them forward in their quest to be number one. Sun in Aries knows that he is meant to be first. Life is a challenge to be overcome. Sun in the warrior sign will dominate relationships because his ego (Sun) is fired by the energy of the conqueror. He wants adventure and will be blunt and confrontational. This is not a partner for the sensitive or faint-hearted. If his relationship becomes stale, Sun in Aries may pick a fight to liven things up. Moon in Aries is a bit of a contradiction. The Moon represents security, but Aries is always pushing for adventure. There is a need to challenge herself (and others) emotionally. Trust in relationships is displayed through the unfettered expression of feelings (including anger), and conflict is a gateway to intimacy. This is crucial to understanding the relationship dynamics of the Moon in Aries partner; the more comfortable she is, the more she’ll let loose. Because the Moon represents inner dynamics, a quieter Sun sign (like Taurus) could initially mask her energy. Fire meets fire and it’s a match made in some high-speed, over-heated realm that these two call heaven. Sun in Aries’ energy will trigger the Moon partner, releasing all her passion and need for excitement. Moon in Aries will support the Sun’s identity and quests for adventure. As a result, he’ll feel free to be himself in this partnership. The Sun will dominate, but the Moon in Aries will give him a run for his money, sparring with him like a trusted competitor. 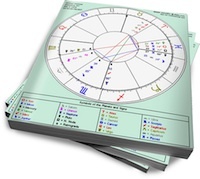 Conflict should not become overwhelming (unless the Moon partner’s chart has more aggressive aspects). Outsiders may view their squabbles as disruptive, but to this couple it will just be part of loving each other. Congratulations on the completion of the Venus/Mars series. Excited to enjoy this new series! Hi, a guy I know has Sun in Virgo, Moon in Aries and she has Sun in Aries, Moon in Capricorn. How compatible are they? Nadia is writing them in order so it’ll be a while. A close friend at work has been incredibly supportive and understanding with everything I have been going through in the last years. I have mentored him on the job but have grown very attracted to him and feel a real synastry between us. He is a Taurus sun, Moon and Venus in Aries, Mars in Cancer; I am an Aries Sun, have a Venus in Taurus, Moon in Libra and Mars in Capricorn. My ascendant is Aries as well. I do not know my friend’s time of birth. We confide in each other a lot. Are we compatible? Is there hope for a long-term relationship or will this just not be worth obsessing over?